GLENBROOK CAMBOGE heifer calf August 2012. Second highest herd average in New Zealand Jersey history. Caitie is the 3rd highest milk ever and 5th highest protein ever for any age group and 4th highest for a four year old. Camelia is the 12th highest ever record for a two year old. Emerald is the 8th highest ever record for a three year old. Cadillac is the 9th highest ever record for a three year old. Calibre is the 10th highest ever record for a ten year old. Once again this season pellet company changed the ration without telling me and the cows fat % crashed again and has been under a 5.0% all month. That's not helping my production and I reckon that alone has cost me 30-35 kgs ms off this seasons record. Hence the lowest herd test in 4 years for May. Worst drought recorded in New Zealand history in the last 170 years which has severely impacted on the production throughout New Zealand. Last autumn cow has now calved. Calibre's record is the 7th highest ever for daily ms and 8th highest for fat. Glenbrook cows in other herds. Analysis of 2 year olds at Glenbrook over last ten seasons. Final results for all New Zealand are in for 2011-12 season. Top 5 herds over New Zealand all breeds. Pity about the power going off here for 2 days in March and affecting the cows so much - were on track for 700 kgs ms average before that happened. 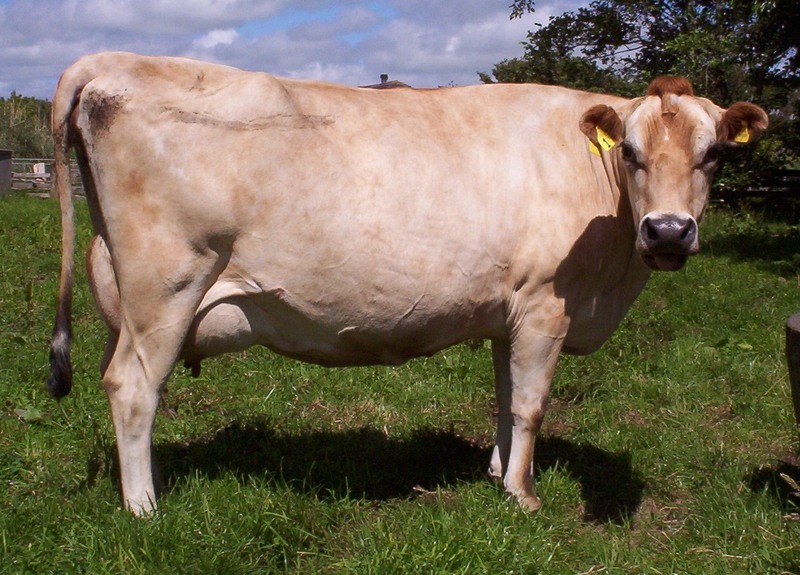 Glenbrook was the all time any herd size production record for New Zealand with 670 kgs ms.
Glenbrook was the highest producing Jersey herd of any size in the Southern Hemisphere. Finally production register for 2010-11 season has arrived. Glenbrook Norman Cruise pictured here as a young cow at Glenbrook. Her ten year old record was produced at Grantham. Glenbrook cows in other herds 2010-11 listed here as well as daughters of Glenbrook cows. GLENBROOK CZAR CADI EX 4 8-8 plus 3 VG and 1G for 5 classified. New milk record for a herd test at Glenbrook of 24.4 litres or 55.3 lbs. Lost Glenbrook Sams Caia with broken pelvis. Had serious feed issues with feed company changing the pellet ration mix without telling me. This caused the fat test to plummet from a 5.6% to a 4.6% average for the whole of September. 2 cows left to calve. Sadly lost Glenbrook Maximus Cuicel, the highest producing heifer ever at Glenbrook. Vet did not have a clue what was wrong with her. 7 cows in now with 8 calves in shed. Glenbrook Sams Caitie broke the milk record for the herd with 43.6 litres or 98.8 lbs milk.